Home » The Writer’s Dictionary » What is the Future Perfect Progressive Tense? Future perfect progressive definition: The future perfect progressive (also called the future perfect continuous) is an English verb tense that expresses ongoing actions that will be completed at a specific moment in the future. What is the Future Perfect Progressive? The future perfect progressive verb tense is a combination of two English verb tenses: the future progressive and the future perfect tenses. 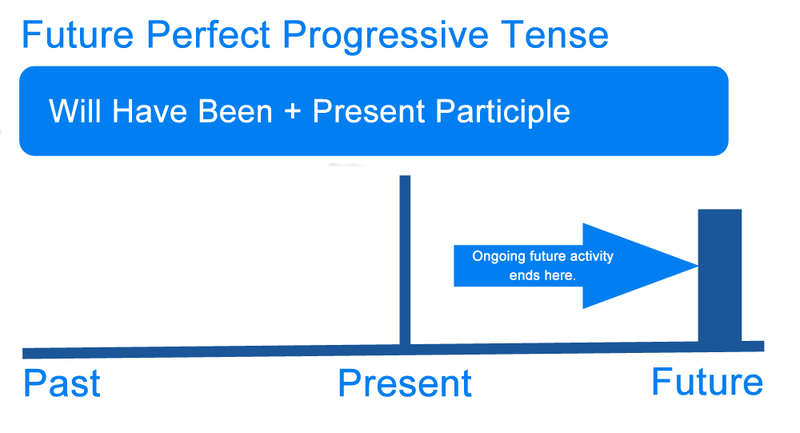 Since it is a combination of a few different tense, the future perfect progressive is a little complicated, but we will go through it in detail so you don’t get lost. The future perfect progressive tense is used to express actions that will start in the future (they have not yet started) and will only last for a set amount of time. Here is a depiction of what the future perfect progressive tense describes. As you can see, an ongoing future event begins and then ends at a specific time in the future. Next summer, I will have been a homeowner for three years. The specific timeframe in this sentence is “three years.” The action that has not yet occurred is the home ownership for three years. At the time this sentence is spoken, the three years have not yet occurred. You will have been studying for six straight months when you take the CPA exam. In this example the future action to be completed is “six straight months” of studying. Once the CPA exam is taken, this action will have been completed. Sometime the event can actually have begun in the past, as in the case with out studying example. You have already started studying, but the act of studying for six months has not yet been completed, so, if it helps, this above image is a different way of looking at the same kind of example. The future perfect progressive verb tense is fairly easy to create. The only variants are the subject and the present participle. The verb phrase remains the same regardless of subject. He/She/It will have been working. We will have been working. He/She/It will have been playing. We will have been playing. They will have been playing. The future perfect progressive tense is most often used to express actions that will last for a set time at a specific moment in the future. This tense is also used to show cause. Both uses are outlined below. This means that an action will occur in the future. This action has not yet occurred or been completed. Furthermore, when this action occurs in the future, it will express a specific amount of time. Ex: We will have been waiting for 30 minutes when Jason arrives. The action that will occur in the future is the waiting. The waiting is given a specific timeframe—30 minutes. When Jason arrives, 30 minutes of waiting will have transpired. This means that something in the future has not yet occurred but is likely to be the cause of another action that will also occur in the future. Ex: We will be in significant debt because we will have been overspending for a month. The overspending is an action that will cause the debt. Both of these actions will occur at some point in the future. Define future perfect progressive: the definition of future perfect progressive is the verb tense used to describe ongoing actions that are completed in the future. is also called the future perfect continuous. 1 What is the Future Perfect Progressive?